Brits are funny creatures. 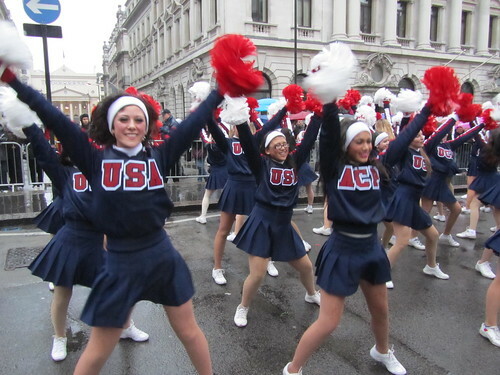 I went along to the New Year’s Day Parade in London today and about halfway through it started to rain. When I say ‘rain’, what I really mean is that the heavens opened and it chucked it down with almighty force until there were rivers running down the streets. Just another day in London. A lot of tourists took one look at the puddles forming on the ground and made a dash for it under their ‘I love London’ Union Flag umbrellas. But we Brits, for the most part, stuck it out – brolly or no brolly. I had an umbrella, but I still got really wet and cold to the point of shivering. It rained so hard that it actually soaked through my leather boots and made my tights soggy. So why did I stay? One reason is that I needed some new photos for my daily photo blog, Picturing England. But the main reason I stayed is that I felt it would be wrong to leave. Those poor people at the end of the parade, especially the marching bands and cheerleaders from America deserved my support. And it wasn’t all bad. An old guy on a bike took pity on me hiding under my flowery brolly and gave me a Quality Street chocolate (strawberry – my favourite) and a kiss on the cheek to wish me a Happy New Year. He understood my British resolve to stand and watch the parade no matter what, and he understood that it would all be made a little bit more bearable with a little sugar. Thank you, kind stranger.